Automated disc printers—also known as auto-printers—can automatically load and print on CD, DVD, and Blu-ray discs without human interaction. Most auto-printers are a combination of a disc printer with a robotic loading mechanism. They are responsible for creating the visual presentation of the disc without the intervention of a user, or the need for outsourcing. 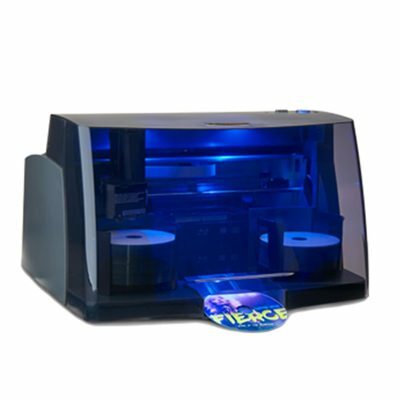 These disc devices are a print only operation; no burner drives are present in comparison with publisher and duplicator models. 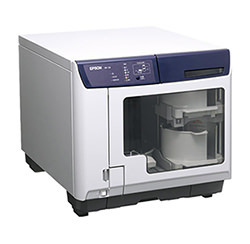 Consumer versions can be small enough to fit on a desktop and have the capacity to handle short run volumes at a disc input of approximately 50 to 300 pieces per run. More professional and upgraded auto-printers will need more space to operate and can take up to a few square feet, weigh more than 100 pounds, and operate at a disc input of more than 1,000 discs per session. Print speeds are highly variable, depending on the system’s settings, however most printers generally take between 30 and 120 seconds per print for a full coverage disc. CD, DVD, and Blu-ray auto-printers can be connected with a computer through the use of a parallel or USB connection. Additionally, network software packages can be installed to allow multiple users to submit and print jobs over a local area network. The printer’s robotics consist of a picking arm to transport the disc from input to output functions. The user only must stack the discs in the input bin and unload them once the process is complete. Discs such as CDs, DVDs, and Blu-ray are gently picked up from the lift arm’s grabber hub feature which grasps the center hole of the disc. A disc release button helps control the function of the gripper by determining its lock and release moments. A sensor built on or near the lift arm will confirm correct alignment properties to ensure printing within the designated disc area. The moving parts help work together to combat imbalanced printing, double feeding of discs, and other errors that may interfere with the printing process or physical properties of the disc. Technology is always evolving to produce faster disc throughput. Aside from mechanics, actual print technology may vary for each machine. Inkjet and thermal printing are the two choices of leading manufacturers for the consumer market. Inkjet is a high resolution, cost effective option that renders vivid color and sharp text. Thermal auto-printers are a more expensive choice for unmatched color consistency of media requiring full disc, photographic quality. This type of printer will result in a larger investment for the consumer.